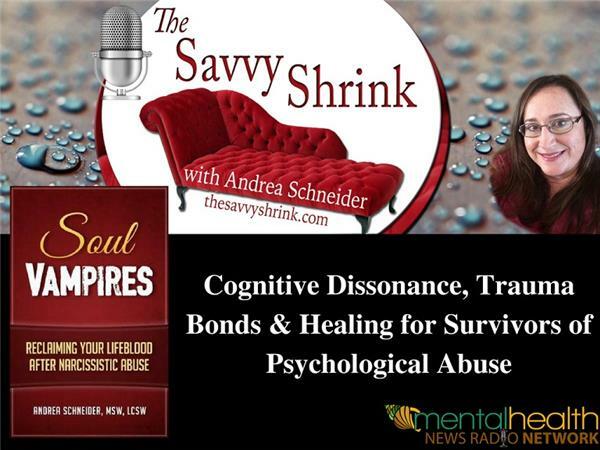 Andrea Schneider, MSW, LCSW, psychotherapist and author of Soul Vampires: Reclaiming Your LifeBlood After Narcissistic Abuse, talks about the concept of cognitive dissonance in the aftermath of healing from narcissistic abuse, in addition to clinical interventions that are evidence-based, trauma-informed, and strengths-focused for survivors. She draws upon her ebook for discussion. A second edition of the book is in the works with more elaboration on clinical interventions. Narcissistic abuse has become a hot buzzword, in part because of recent political events which have made the word "narcissist" common vernacular. No one is immune from the talons of a malignant narcissist, and Andrea discusses how targets of abusers are often highly intelligent, empathic, self-sufficient and successful individuals. Narcissists can sink their talons into unsuspecting people in love, work, family or friend relationships. It's never the survivor's fault they were harmed. The good news is that survivors can heal and move on into a new chapter of reclaiming their wellness. Andrea talks about those steps in this podcast.